If you have an interest in joining the Brit Iron Rebels and riding with the BIR LA Clan, read on. 1. You must currently own a true classic or retro British motorcycle. (See "Qualifying Bikes" below). 5. You must participate actively as a Candidate and Prospect for a period of at least 9 months (See "Membership Details, below). 6. You must gain sponsorship from 2 active LA Clan members. 7. The LA Clan must approve your membership by unanimous vote. 1. Full-time access to the Member Only Internet Forum. Still interested? If so, contact us. LA Clan membership requirements exceed the minimum requirements established by BIR Worldwide. Once you submit an application for membership, you may be invited to attend one or more meetings/rides/events. After you have joined us for at least one meeting and ride, the club may invite you to become a “Candidate” for membership for a period of at least 3 months. If you demonstrate strong interest in membership by participating actively in our rides and events, the club may invite you to become a “Prospect” for membership, for a period of 6 additional months, during which you will be introduced to the worldwide club membership. If you fail to demonstrate strong interest by actively participating in rides and events, the club may remove you from the membership process at any time. After the 5th month of your Prospect period, you must seek out two sponsors to vouch for you for membership prior to the end of the 6th month. Once you are vouched, the LA Clan will vote to either accept or reject your membership. Site design and logo ©2004-2015 Brit Iron Rebels LA. Photographs ©2004-2015 by their respective owners. All Rights Reserved. Please request permission before using any content from this site. We respect copyright and will remove any image upon request. 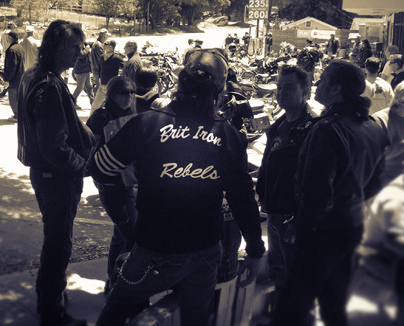 Brit Iron Rebels is not affiliated with any other club, product or service pictured on this site. Report site errors to webmaster.